This short course offers a unique opportunity to create a hand made book at the Schoolhouse for Art. This is a perfect midweek activity with a wonderful product produced in a small time, and an experience worth a life time. During the 3 mornings, participants will be introduced to the traditional craft of bookbinding. Beginning with the simple book structure you will learn about paper, materials and tools need for creating your own books. 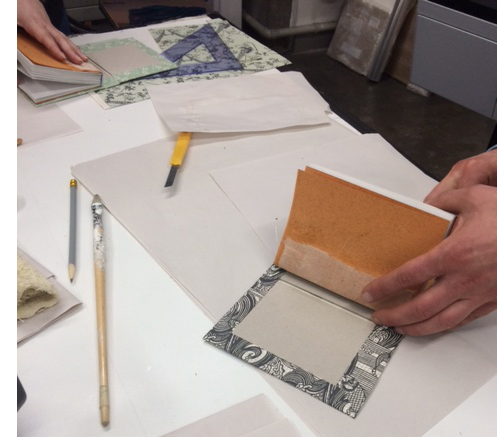 Each participant will finish with a hand bound notebook and a selection of smaller pieces. This workshop is suitable for beginners. Born in Dublin, Byrne began her studies in art at Dublin Institute of Technology. She developed a passion for bookmaking when she worked as a graphic designer in San Francisco. There she designed, illustrated and mocked up books in a small graphics studio under the watchful eye of master typographer and lecturer from the Californian College of Art. After 5 years she returned to Ireland before heading to Edinburgh to complete her Masters in Design at the Edinburgh College of Art in 2002. In Edinburgh she was introduced to the craft of bookmaking along with the art of print and has been combining the two disciplines ever since. Caroline has been a member of the Blackchurch Print Studio in Dublin since 2004, where she creates her limited edition artists books. She has exhibited extensively in Ireland and the UK including solo shows in 2004, 2005 and 2006. Her work is held in private and public collections including NCAD, and the OPW. Byrne facilitates workshops in relief printmaking and bookmaking at the Blackchurch Print Studio in Dublin and the National Print Museum. We are delighted to welcome her to the Schoolhouse for Art.